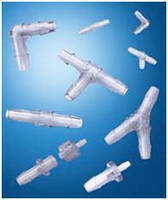 Large Format Sterile Connectors have single-use design. 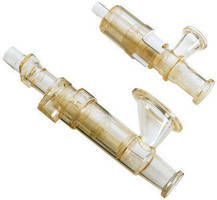 Quick Connect Adapters, Sanitary Inserts target biopharmaceutical manufacturering. 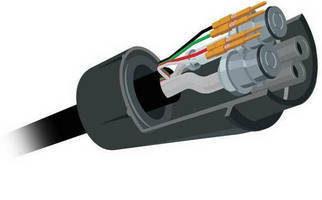 Medical Device Connector integrates air line and electronic connections. Mini Hybrid Connector integrates air lines and electronics into single connection point for remote tools on medical devices and equipment. Valved solution, suited for use in low-pressure applications, eliminates need for multiple connections and allows clinicians or therapy patients to change/replace modular tools, umbilicals, or hand pieces that require power, signal, and gases. Sterile Connectors suit single-use processing applications. 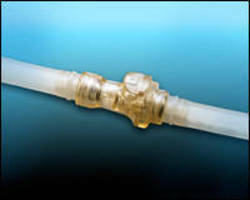 Precision-Molded Fittings offer leak-free tubing connections. Targeting medical device OEMs, FitQuik(TM) Fittings offer variety of options, including color coding accessories for luer connectors, tube fittings with expanded hose barb sizes, and Ã‚-¼-28 in. UNF threads. Units are available in nylon and medical-grade polypropylene, and are designed for tubing sizes from 1/16-3/8 in. Tube Fittings aids in fluid handling applications. Featuring precise hose barbs and thread forms to ensure a secure fit, FitQuik(TM) Connectors are available in black and white nylon and animal-free, natural polypropylene. Fitting styles include luers, tube-to-tube, thread-to-tube, blood pressure fittings, and are offered with NPT and 10-32 threads. Quick Disconnect Couplings allow aseptic disconnection.